Laboratory Switching Power Supply, DC 1-36V 0-10A, Programmable, LAN, USB, RS-485 This programmable high performance switching mode power supply with new modern microprocessor technology enables the programming and configuration of all parameters on the device keypad or remotely via a PC. 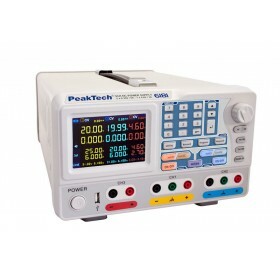 The color LCD display makes the setting of several parameters easy in use and displays the real-time output data of voltage, current and power also as a line graph. It is operated via the graphical menu system and enables the user to take simple control for programming its many features and functions. 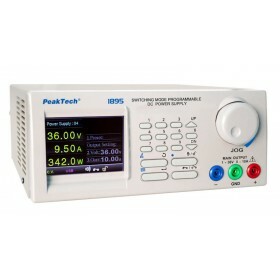 This modern power supply unit is also equipped with LAN, USB and RS-485 ports for remote control, programming, monitoring and data acquisition via PC interface or via SCPI commands. 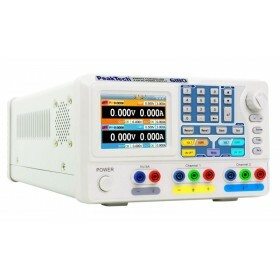 Laboratory Power Supply, DC 2 x 0-30V 0-3A, 5V 3A, Programmable, USB RS-232 The innovative PeakTech 6180 power supply unit with color TFT display combines the advantages of a linear-controlled laboratory power supply unit with the remote control options, which have mostly been reserved by switching power supplies so far. It is operated via the graphical menu system and enables simple control and programming of its multiple features. In addition, the device is using the included PC software that allows a complete remote control. For doubling the output voltage or output current values, the two independent channels can be interconnected in serial or parallel circuit. Also a plus/minus connection of the outputs is possible. Laboratory Power Supply, DC 2 x 0-30V 0-6A, 0-6V 0-3A, Programmable, USB RS-232 The innovative PeakTech 6181 power supply unit with color TFT display combines the advantages of a linear-controlled laboratory power supply unit with the remote control options, which have mostly been reserved by switching power supplies so far. It is operated via the graphical menu system and enables simple control and programming of its multiple features. In addition, the device is using the included PC software that allows a complete remote control. 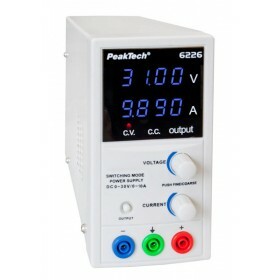 For doubling the output voltage or output current values, the two independent channels can be interconnected in serial or parallel circuit. Also a plus/minus connection of the outputs is possible. 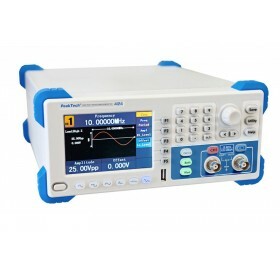 Digital Spectrum Analyzer 9 kHz - 3.0 GHz Spectrum analyzers are used to display the amplitude distribution over a certain frequency range. This spectrum analyzer thus makes visible the individual spectral components with the corresponding amplitudes, which is making this device indispensable for the assessment and diagnosis of modern, high-frequency electronic systems. 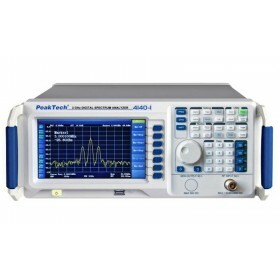 Due to the high frequency bandwidth and dynamic, modern spectrum analyzers are superior in many measurement areas contrary to the use of oscilloscopes and therefore preferable for the application. The high technical performance and many features makes this device ideal tools in industry, development, EMC diagnostic and quality assurance. DDS Arbitrary Waveform Generator, 1 µHz - 10 MHz, 2 Channels, 14 bits Vertical This newly designed direct digital synthesis (DDS) arbitrary waveform generator with advanced graphical user control has excellent technical properties and a high variety of functions. Of particular note here are the easily control via the various menu functions, a wide range of integrated waveforms and the excellent price/performance ratio. In this way this generator is perfect for almost all tasks in education, research and development. DDS Arbitrary Waveform Generator, 1 µHz - 10 MHz, 1 Channel, 14 bits Vertical This newly designed direct digital synthesis (DDS) arbitrary waveform generator with advanced graphical user control has excellent technical properties and a high variety of functions. Of particular note here are the easily control via the various menu functions, a wide range of integrated waveforms and the excellent price/performance ratio. In this way this generator is perfect for almost all tasks in education, research and development.